2019 is poised to be a better year for the Latin American economy after a tough 2018 characterized by a chaotic and noisy election cycle, a sharp decline in sentiment for emerging-market assets and a U-turn toward global protectionism. Next year, regional growth (excluding Venezuela) is expected to improve to 2.3% from the 1.7% projected this year. Strengthening momentum in Brazil thanks to an improving labor market, less political noise and the faded impact of the truckers’ strike will chiefly fuel the region’s acceleration, while Argentina should drag less on growth after this year’s hard economic adjustment. To a lesser extent, faster growth in Chile and Peru will also boost regional growth. Downgrades to Argentina and Brazil’s prospects drove multiple cuts to Latin America’s 2018 GDP forecast over the course of this year, especially due to shocks from a severe drought in Argentina and a truckers’ strike in Brazil. While uncertainty has faded in recent months, with IMF support shoring up Argentina’s outlook and Brazil’s President-elect Bolsonaro vowing to push on with economic reforms, anxieties still linger. Of particular note, Argentina heads to the polls next year to vote in a crucial general election, while many analysts doubt whether Brazil’s new goverment will be able to pass much-needed reforms given the tough political climate. Hiccups or unmarket friendly outcomes would increase uncertainty and weigh on the region’s growth prospects for next year. Similarly, policy uncertainty in Mexico surrounding AMLO’s nascent presidency has already jittered markets and is clouding the outlook for next year. A less supportive global backdrop due to rising protectionism or less demand for emerging-market assets is a key risk to Brazil’s forecast. In addition, reform standstill or weaker-than-expected measures could also shake confidence in the incoming goverment. Short-term growth prospects were bruised in recent weeks by the policy uncertainty surrounding AMLO’s nascent presidency. In particular, analysts have slashed their investment projections due to firms’ anxieties over the new administration. FocusEconomics analysts now see growth at 2.1%, down 0.1 percentage points from last month’s forecast. More broadly, however, tight labor markets—both domestically and stateside—are expected to support growth in the coming years. On the external front, the newly-minted United States-Mexico-Canada Agreement (USMCA) should support exports over the long-term. Analysts see growth at 2.2% in 2020. Higher fuel costs and pass-through from the weaker peso should keep inflation elevated over the coming months before receding next year. FocusEconomics analysts see inflation converging toward Banxico’s 3.0% target over the next couple years, ending 2019 at 3.8% and 2020 at 3.7%. Analysts are on the fence over whether the new administration will be able to meet its promised fiscal-surplus target, although a number of them have given its first budget, presented on 15 December, the benefit of the doubt. Our latest Consensus Forecast, published ahead of December’s announcement, revealed that analysts again downgraded next year’s fiscal deficit, from 2.3% to 2.4%. This is in line with similar revisions that have become the norm since AMLO’s political campaign began gaining traction about a year ago. The Chilean economy should finish this year on a strong footing, recovering from the third-quarter slowdown amid solid non-mining growth. However, activity is expected to lose some steam next year, against the backdrop of moderating global trade which is likely to take a bite out of Chile’s all-important exports sector. Nevertheless, the overall expansion will likely remain robust, spearheaded by sturdy domestic demand. Prudent macroeconomic policy should keep inflation at bay, which, coupled with higher wages due to the tightening labor market, should prop up household consumption growth. In addition, an overhaul of the tax system is expected to bolster investment activity next year. Our Consensus Forecast shows GDP expanding 3.3% in 2019, which represents a cut of 0.1 percentage points from last month’s forecast, and 3.1% in 2020. The Colombian economy is expected to pick up next year on firm oil prices and greater investment, especially in the extractives sector, and stronger household spending. Private consumption should be supported by a tighter labor market, while strengthening business confidence, thanks to the market-friendly political backdrop, should fuel an upturn in fixed investment growth. 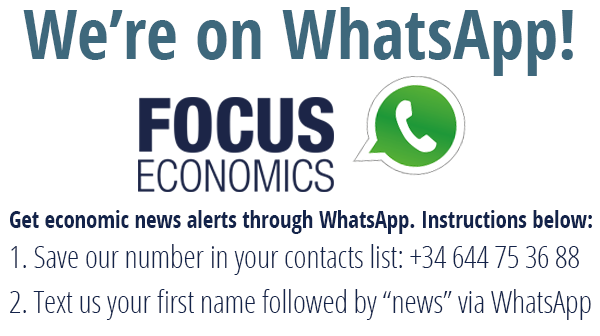 FocusEconomics’ network of analysts covering Colombia expects GDP to grow 3.2% in 2019. While rising commodity prices, coupled with a weak peso have stoked price pressures, inflation has remained within the 2.0%–4.0% target range in recent months and is expected to end 2019 at broadly the same level as in 2018. Inflation is expected to end 2019 at 3.4%, according to our Consensus Forecast. While Colombia’s fiscal position is improving, the significantly watered-down tax reform, with its original revenue target halved, poses challenges for the government in meeting its medium-term fiscal goals and bringing down the public debt burden. Fierce opposition to the planned tax of basic foodstuffs forced the government to abandon the measures, and put a freeze on spending to stay in line with the country’s fiscal rule and avert a potential credit rating downgrade. Moreover, the diluted tax bill has revealed the limitations of President’s Iván Duque’s political capital in delivering the tough reforms pledged during the election campaign in the face of an opposition-controlled Congress. Next year, the economy should expand solidly, underpinned by a healthy domestic economy and robust external sector, thanks to demand for commodities. Improving investor confidence, solid credit growth, a favorable business environment and rising infrastructure spending are expected to buttress fixed investment. Moreover, moderate inflation, rising wages and steady employment gains should support consumer spending. Meanwhile, public finances will remain in good health, providing the government fiscal room for maneuver if required, while large international reserves should shield the country from possible capital flight. Upside risks stem from the possibility of Vizcarra’s government delivering market-friendly reforms, while escalating global trade tensions and a possible slowdown in China’s economy, which would weigh on demand for exports, represent the main downside risks. FocusEconomics panelists see GDP expanding 3.8% in 2019. Ecuador has accumulated a sizable debt burden through its heavy reliance on external financing, primarily through loans-for-oil deals with China. While President Lenin Moreno has indicated that the country plans to renegotiate the terms of the debt and has slashed public spending in a bid to close the fiscal gap, the economy might struggle to achieve its 2019 financing plan without IMF assistance. The economy is expected to lose steam next year as the government slashes public spending to strengthen its fiscal account. Private consumption will also likely lose ground as inflation picks up and credit growth weakens. While measures are underway to close the fiscal gap, the economy might be hard-pressed to achieve its 2019 financing plan without IMF assistance. Meanwhile, tighter global financial conditions pose downside risks, due to the dollarized economy’s heavy reliance on external financing.